Gold, Silver and Dodger Blue! Ahhh, the awards are coming in! Gold gloves for Matt Kemp and O’Dog! Congratulations to both gentlemen! but wait! there is more! 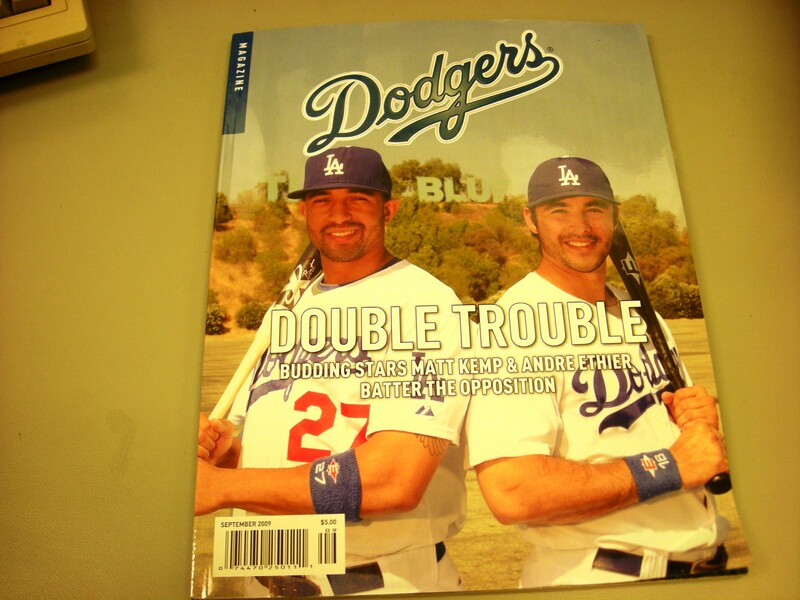 The dynamic duo of Andre Ethier and Matt Kemp get Silver Slugger awards!!! Congratulations guys! I’ve been in N.H. this week. We brought the nice sunny weather from Southern Cal!! It has been in the 50’s here but the rain will start Saturday when we leave :-)) I was supposed to be in N.H. the prior week BUT I had to leave that week open in the event that my Doyers were going to the World Series. Oh well, The only thing I regreat that I missed this week back home was that Vin Scully was going to be at the HRTS (Hollywood Radio & Television Society) luncheon on Tuesday 11/10/09. Had I been in L.A. I would have gone to the luncheon to hear Vin Scully’s stories. The good news is that Vin Scully said Tuesday he will continue in the broadcast booth for the Los Angeles Dodgers through the 2010 season, then decide whether he will walk away :-(. I know the day is coming, I just want the last year of Vin to be a memorable one. Vin, who turns 82 on Nov. 29, and his wife Sandy celebrated their 36th wedding anniversary Tuesday. Congratulations Mr and Mrs Scully! The Dodgers hit the commodoity market jackpot with several gold and silver awards in the last few days. Congrats to Matt Kemp and Orlando Hudson for their Gold Glove selections. And let’s not forget the Silver Sluggers that Andre Either and Kemp bagged tonight. Now Kemp only needs some sort of bronze of platnium awards and he will have the trinity of precious metals. Always great to see your guys get the press for doing it with both a bat and their gloves. Totally awesome news for Big Blue. Wow, a gold glove AND a silver slugger for Kemp! Hooray for precious metals! And congrats to Ethier and Hudson as well. Have a safe trip back home from N.H.! November 13, 2009 - 5:00 pm Elizabeth D.
It will be a very emotional day when Vin Scully walks away from the broadcast booth. As an aspiring broadcaster, he is one of my greatest roll models, and I am looking into Fordham University because he went there. Congrats to your boys for the Gold Gloves and Silver Sluggers, they certainly deserve them! I loved to see Ethier play this season. Andre and Ethier are first timers with these awards so I am so happy for them! Yep! Gold and Silver for our Kemp! thanks! I am in Boston now as I have an early (6:30) flight tomorrow morning from here. OM! Will it ever be emotional for us fans! I think I will take a box of kleenex that final day when Vin broadcasts. You should really write to him at the stadium. He does responds. Ethier was a breath of fresh air watching him play! I saved all my tickets from his walk-offs at home! Emma, congrats to all your guys during this awards season. Very impressive. And great news that Vin will be back in the broadcast booth for another round. Safe travels back to CA. Congrats to the Dodgers! Glad you enjoyed your trip back east! I remember reading Matt Kemp’s twitter when he was like, “I won a gold glove! !” He was so excited. Congratulations to the Dodgers. No doubt Andre Ethier, Kemp, and Hudson were essential to the teams success this season! It’s very hard to imagine Dodger baseball without Vin at the mic. I saw the Harwell/Costas interview last night and thought… wow, after Ernie’s gone… Vin is the last legend standing. I hope you will have a fun & wonderful Thanksgiving. I’m sure our Boys in Blue (specially KEMP) have a lot to be thankful this year! HAPPY THANKSGIVING & GOD BLESS YOU! Thank you so much! You too! Have a wonderful Thanksgiving with your family. Last Saturday I went to a Tamale making party. It was a lot of fun. We had women and men helping out. My friend Stephanie alwasy invited me every year but this is the first year I was able to attend. There was so much food Prior to making the tamales and once those were done everyone took a bag home. God bless you too and happy Thanksgiving! Jane, Emuly, Julia & Jeff! I miss you all! I just been so busy at work. I am glad that the off-season is my busiest time at work. It does not slow down for me until mid February.